In the Catholic tradition, sacred art is not intended to be viewed passively. “Art isn’t simply to be interpreted, but art in turn helps us interpret our lives,” said Augustine Institute professor Tim Gray. Over a one-hour lecture, Gray talked about famous pieces of art in history and the Catholic viewpoint on its importance. Paintings have the power to raise hearts and minds up to the heavens and God himself, he said. 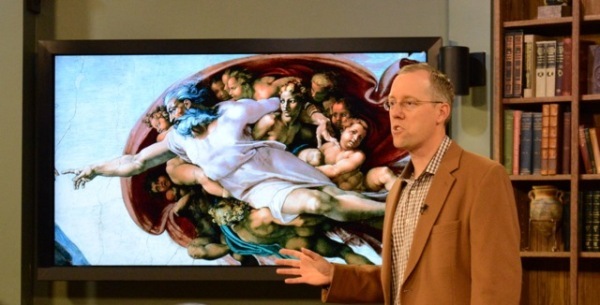 His lecture was shared live online Sept. 18 from the Greenwood Village-based institute before an audience from the Colorado Chapter of the Patrons of the Arts in the Vatican Museums. You may also view the lecture here. If you’d like to attend future events like this one, please be sure to contact us today and maintain your membership.